Breathwork is something I have been exploring more so this past year in my own journey of personal healing and transformation that continues. Breath is critical in my yoga practice and meditation practice and my climbing. As I have doven in a bit more, I realize that breathwork has been a part of my life the last decade since I started climbing mountains. 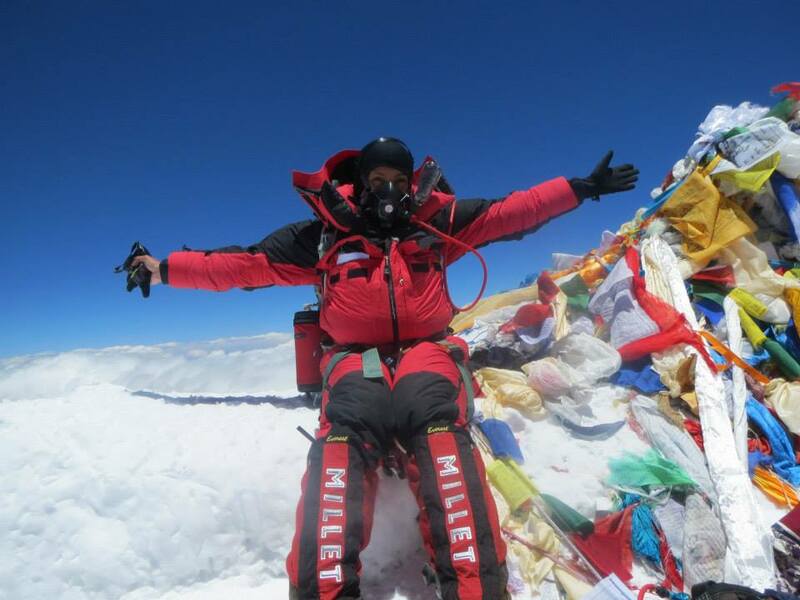 It was not only mind over matter to reach many summits, but concentrated breath. Managing my breath was also the key factor in helping me run my first mile a little over a decade ago and then being able to run marathons and half marathons after that. Breath has been been a force to tame and quiet my mind, making some of the daily challenges of depression more manageable. An on and off battle that’s existed for me since I was a teenager. I’ve chosen breath, movement, nature, and meditation as my medicine of choice. I am often asked what were some of the key differences between my experience of climbing Mt. Everest in 2011 and 2013, in essence why was I successful in reaching the summit one year and not the other. While there were many factors, including weather, my answer has always been that meditation made all the difference, but it was more than that. By 2013 I had not only developed a meditation practice, but also was far more in tune with my mind, body, and spirit. I had spent time since my first attempt exploring more of my spirituality and what that meant for me. I had learned about the book a Course in Miracles and started with another book titled May Cause Miracles by Gabrielle Bernstein. This book was a 40 day condensed version of components of The Course in Miracles and a modern take on the original course. It was a great way to introduce myself to to world of miracles, aka a shift in perspective from fear to love in any circumstance. I had already read and completed the book before I set of for Everest on attempt number two, but I also made the decision to bring the book with me and complete it again while on the mountain, as I would be on the expedition up to 60 days. More than anything I wanted to be fully present and focused those 60 days. A combination of my breathwork and a dedicated meditation practice on that mountain was critical to my successful attempt as I had gotten hypoxia on my first attempt in 2011, just 1500 feet from the summit. For those of you unfamiliar with hypoxia, it’s when your body doesn't have enough oxygen. Without oxygen, your brain, liver, and other organs can be damaged just minutes after symptoms start and it’s a highly dangerous condition. In my case, my whole digestive system shut down and it was a pretty scary descent to Camp 4 (26,000 ft) in the middle of the night, not knowing what was happening to my body. Needless to say I survived the episode and got myself down safely in the days that followed all the way to Base Camp at 17,500 ft. While I was using a low flow of supplemental oxygen past Camp 3 in 2011, we were forced to stay at Camp 4 for about 30 hours due to a storm before being able to go to our summit push. My body was deteriorating quickly and that was evident as I collapsed at the Balcony. When I went back in 2013 I knew that a strong body was not enough for this climb, a strong mind and spirit were equally if not more importantly necessary in order to be able to handle whatever the mountain and mother nature threw at me. It was breath, mindfulness, and miracles that got me up the mountain and down safely in 2013. You can read my full account here. Going back to 2008, my first lesson on breath and mountains came to be on Mt. 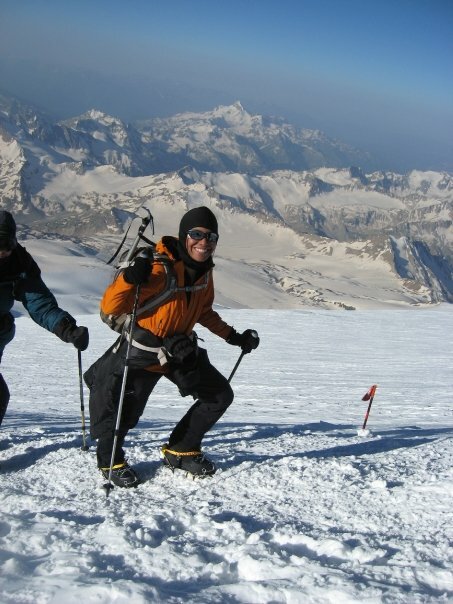 Elbrus (5,642 m (18,510 ft)) in Russia by the one and only Vern Tejas. I was getting altitude sickness around 13,000 feet on the mountain and all I wanted to do was curl up in a little ball and snuggle into my sleeping bag and stay there. My appetite was gone, my head felt like it was getting slammed with a thousand hammers and energy was on an all-time low. Did I want to quit? Heck no! Vern had already started to introduce our team to the importance of pressure breathing and rest stepping. It would be the perfect combination of the two that would help our bodies adjust to increasing altitude and keep us centered and moving in a balanced healthy fashion. The combination of this perfect duo can keep you going for hours on end with short breaks in between.Long breaks are not beneficiary as your body cools too much and then harder to get back in flow again. Thus, starting and stopping constantly is a total energy killer, rather continuous balanced motion is ideal for sustained endurance. Breath was life on the mountain, without a concentrated effort of your breath, your chances of reaching the summit were unlikely. It’s made me think the same goes for life and achieving peace and happiness. Breath is indeed life. There are many studies showing the multitude of benefits of concentrated breath which include, but are not limited to: reduced stress and anxiety, more focus and mental clarity, better sleep, help for symptoms of post-traumatic stress disorder (PTSD), improved physical performance in sports, and more. While I always came back from high altitude climbs with a sense of euphoria or like I had just undergone a mystical experience I could not replicate in other aspects of my life, I now understand why. It was not just the mountains, the beauty, the adventure, but also the dedicated practice to breath, which brings a new level of healing to the self and can take us to new levels of consciousness. Living on a mountain for 2 months at high altitude is not for the faint of heart, but it is also one of the most wonderful experiences of my life so far. Vivid impressions of lightning storms off in the distance or glorious moments of the sun breaking through from camp will live with me forever. I feel very fortunate that I have been able to experience this twice in my lifetime along with two other 20+ day expeditions at high altitude and many multi day or week expeditions over the years. While I do enjoy the finer things in life at times, I equally love my tent time perched up high in snow and rock. There is nothing like it! It’s like coming home to a part of yourself. Something magical happens where your daily focus shifts to your general well being and awareness of your environment. Spending 4-12 hours of your day in a magical mountain setting with a strong focus on your breath and movement allows for your mind to clear and enter another dimensional state. Our mind wanders, but when tackling a beast of a mountain, you have to go down to the basics, one breath, one step at a time, that is what will get you up and down safely. So on this daily journey, as your mind wanders and maybe brings to surface your fears, worries, doubts, self attack, bad memories, and more- you have no choice but to be an observer and breathe through the discomfort. To pay focus to such bad or disturbing movies playing in your head, or focus on the discomforts happening in your body inhibits your ability to perform and has the potential to impact your ability to complete the challenge at hand. So you have no choice but to breathe through it all and let go. Simply focus on your breath and movement of your feet. It’s a beautiful lesson in impermanence, this too shall pass, and change in that given environment is a constant. Each day on the mountain you get more and more present, more in tune with your body, more in tune with your spirit, more in tune with the earth, and the nature all around you. What seemed big and worrisome gets put into perspective, not just due to the landscape, but as your breath clears and heals it all away as you slowly keep moving forward. While I knew time in nature and mountains had been extremely healing in my life, understanding the role breathwork has played allows me to find ways to better integrate these same aspects in my day to day citylife, and share that with others for their own healing. Not everyone wants to go climb a big mountain and that’s ok. A big part of the journey has been to keep exploring ways to replicate effects of mindfulness in these extreme places and nature into everyday living. To date a practice of mindfulness and breathwork has been key. Mountains have become my sacred space. High altitude ones in particular as they test every aspect of your being and mind. In this journey of a test of will and being, you connect to your true essence unlike any other way I have been able to before. They become truly spiritual experiences. My recent breathwork sessions have brought me to a place close to what I may have felt at moments in these extreme experiences and it’s been fascinating to explore and go deeper to tap into other parts of consciousness to better connect with my true essence in daily life. It’s been a fun challenge to create daily sacred space and know that this is indeed possible. “With my oxygen adjusted and going at my slow steady pace behind my friend’s guide, up the mountain we went, behind long endless queues of climbers in the still of the night until the light of the sun broke through and exposed the beauty that was hidden in the night. A piercing line of bright orange hit the horizon and slowly grew to shine over the whole world below us and instantly brought me to tears. I was filled with warmth and knew that my sign had been clear as day and there was no turning around. The wonder and magic of creation had never been more evident, nor had I ever felt so connected to the universe and our creator; it was a truly spiritual moment and I felt so small and blessed at the same time,” from my full account of my 2013 expedition. It’s hard to put into words the sunrise I experienced on Mt. Everest 2013. It’s something I feel not only incredibly blessed to have witnessed, but also grateful I can still close my eyes and feel that moment to this day 5 years later. It alone was transformational and despite my many sunrises on mountains and in nature, nothing compares to that moment where all of life and existence seemed to make sense and be in perfect order. A true moment of AWE. Granted I was definitely struggling with my breath at that point as my oxygen mask had frozen and I felt like I was suffocating (I like many climbers had supplemental oxygen on my ascent past camp 3 on Everest or past 25,000 feet). I remember peeling the mask off my face to break away at the frozen ice and breathe in the limited air around me. I felt so alive and each intake of air nourishment to keep going, each breath a gift of life. A am a big believer in synchronicity and many times in my life it has been my reassurance I am on the right path. Synchronicity is the simultaneous occurrence of events which appear significantly related but have no discernible causal connection, a concept introduced by psychologist Carl Jung. “The climb up to the Balcony became the hardest part of the climb for me. It was my nemesis I had to conquer! The same hypoxic symptoms from two years ago presented themselves again and I was moving or crawling at a snail’s pace. There was added pressure to move faster and I was being warned that I was moving too slowly. Among the many little miracles that led me to the top of the world, the most impactful one happened as I was about to reassess my condition and determine whether I would continue the climb. I will never understand how this man recognized me through my down suit, oxygen mask, and at 2 a.m. in the dead of the night, but in my state of fatigue and worry, I prayed and asked God for a sign as to whether I should turn around or not, and no more than 10 minutes later as I sat and cried in the snow, my friend’s guide managed to see me and asked, “Georgina from San Francisco, what’s the matter?” After I told him what was all going on he said, “You already turned around once 2 years ago, you are not turning around again.” He then talked to my Sherpa, they adjusted my oxygen and he asked me to follow them for an hour and see if I felt better and that I was only 5-6 hours away from the summit. I looked to Jang Bu to make sure he was happy for us to keep going, at which point he said, “We try.” Trying was not an option for me, and I wanted his confidence in me to keep going as well, so I said, “no, we DO, we do not TRY!” From that point forward everything was different.”- from my full account of my 2013 expedition. It was a beautiful moment of synchronicity, of letting go of the outcome, and the universe coming through in lightning speed. A moment that really pushed all of me to look past fear and find that loving place in myself to be silent and listen as to what to do next. Had I focused on fear, no doubt I would have lost control of my breath and only aggravated the situation. I have looked back on this moment many times in my life since then during challenging times as a reminder to trust in love not fear, and let go of my preconceived outcomes. It’s always easier said than done, but I do believe it opens a portal for good things to flow into our lives when we can be in this mindset. You can read my full account of summiting Mt. Everest here. I can’t wait to climb my next mountain or go on another endurance challenge and keep exploring with breath and its impact on my experience. Until then in city life, I will keep with my breathwork practice. Currently primarily following the Wim Hof Method. In addition to that I continue to explore Pranayama Exercises & Poses with my yoga practice. You can also learn more here. I will also likely work with a breath work practitioner for additional healing when the time is right. I really can’t recommend breathwork enough to infuse energy, positivity, and transformation into your life. If there have been deep personal wounds that have needed healing, this is a wonderful natural way to help heal those and create space for wonderful good things in your life. While I can’t always be climbing mountains, as much as I wish I could, it’s been life changing to develop these practices in my city life when I can’t get out to nature. It’s also a wonderful reminder that we are not our mind, not our thoughts. This practice allows you to tap into your true essence at any given moment and remember that our true essence is good and love. Our mind just does a fabulous job of muddying the waters and so that connection to self and source can feel like it’s lost at times, but really it’s always there inside of us. I have so much to thank the mountains for in my life, but their ability to connect me to my breath and spirit is definitely one of them.